What Caused America’s Moral Decline? One by one, the elements of human virtue in our society are being destroyed. To some it’s just a sense; like a faint wind. For the rest of us it’s the approach of a storm so dark and ominous, we can barely fathom to look. Alarmed, we fly straight and do what our respective religions tell us to, but our culture just keeps spiraling deeper into the mindless and the obscene. A recent poll showed that most adults consider our moral decline to be the single-most important issue in America today, but they feel helpless: few have any idea what to do about it. With 34,000 different Christian sects, all separated by disagreements, it’s no wonder. What on Earth should we follow? A Lifetime Struggling with Moral Confusion. In the beginning, I didn’t have any answers either. After giving everyone the benefit of the doubt, not judging, sacrificing myself to others, and being selfless, I was at wits end. I was being eaten alive by the very moral code that was supposed to make my life better! Worse yet, when I asked innocent questions to gain a better understanding of moral principles, I was met with ridicule, threats and sometimes even violence. The problems aren’t just at the media/ business/ political level; they start much sooner. In society? Sooner. In our families? Sooner. Where then? Moral confusion is responsible for these maladies and many more. We’d be fine if we had a clear moral track to run on that made sense, but we don’t. Not since The Inquisition has mankind faced a moral crisis of such epic proportions, and little do we realize that these issues all share a common solution. What’s good about these problems is they all stem from a single source. Pull that plug, and they all go down the same drain. What I’ve developed is a real, tangible solution; a morality that takes us from the ground up and rebuilds our whole concept of good and evil according to a standard we can all agree on, because we live by it already. My Road to Moral Clarity was Like a Street Fight. Hi. Im Author/Philosopher Ronald E. Springer. As a child, I experienced firsthand the nightmare of dishonest people abusing others through a poorly interpreted moral code (the Tom Cruise/ Matt Lauer interview on Scientology was mild by comparison). I was unusually sensitive; aggression, denial, carelessness–I knew these things to be wrong practically from the first time I opened my eyes. I wanted to be the best person I could be, but those giving me moral guidance were leaning in to intimidate me, shaking fists in my face, hostile because I didn’t “just believe” what they said. Ask the wrong question and I’d wake up on the floor. They weren’t like I imagined Jesus or Moses to be. They claimed God would forgive them anything, and proceeded to move through the world like the Romans did; not like Jesus. So who was their true idol? If moral judgment was to be interpreted and applied by men, then their interpretation was wrong, and to this day, I can’t remember any of their moral lessons. I only remember the violence. Eventually, I found what I considered honor and sound judgment in Benjamin Franklin, Abraham Lincoln, and even in my own view of Jesus, seeing the kind of calm, friendly people I would never fear to encounter. Someone I could ask anything of. Someone I didn’t have to run from. These are the men I chose to pattern my life after, but it seemed I was alone in this. As time went on, I watched those less aware in my generation bumbling down the same path of my elders and I’d laugh. But with life experience, I saw the insanity extrapolated deeply into business and world affairs; it marred everything in its path. I couldn’t escape its influence, and still couldn’t believe that anyone took it seriously. I was eager to share my road of achievement with others, but as my fortunes grew, so did my distance to others; and little by little, I lost everyone. Heartbroken, I couldn’t see what I was doing wrong. I worked so hard; wasn’t I good enough? The more I tried to help, the more I was rejected. Everything I did to think clearly, live a good life and be a good person, brought me penalties. My head wanted to explode, and I could sense that it was all tied together somehow. There was some great evil behind it all. Around the next corner of life, I met the girl of my dreams. Outwardly, she appreciated my achievements and I did my best to inspire her; but inside, she seethed about it. Instead of fulfillment, it became a war of the worlds. With my philosophical background, I thought I could save her. I had no comprehension of the leverage she had on herself to maintain a destructive course, OR what drove it–and it cost me, dearly. There was something philosophy didn’t teach me; something about the nature of good and evil that was not yet known; something that left me drastically vulnerable. I couldn’t change her, and only ended up hurting myself. It was the last straw. I let her go. I let the rest of the world go. I went underground, resolved to put an end to the insanity. It was a long dark journey that altered my destiny. I now have over twenty thousand hours in philosophy and psychology, about two PhD’s worth, tailored to a single end; to expose evil and end its reign by bringing men a moral and spiritual empowerment beyond anything the world has ever known. In the last ten years, I’ve developed an organic moral code that will show you how to move through life with complete moral certainty. As a result, I’ve appeared on many radio shows around the nation, among them The Mitch Albom Show of ABC, NBC and Fox News radio affiliates, including enjoyable interviews with clergymen. Even Charlton Heston, who was deeply religious, contacted me with well-wishes. Soon, I’ll embark on a lifelong media campaign to help us all secure better relationships, safeguard our families, reform our country’s moral drift, and send evil packing. I Treated Morality like a Technology, and found out that’s exactly what it is. The real value comes when youve blazed a trail that others can follow. I wanted all of life to be integrated; to know my purpose and to see it flow seamlessly with my relationships, the rest of the world, and with nature itself. By NOT attacking the beliefs of others and approaching the subject constructively, I was able to see that most of us share similar concerns in life. Instead of walls being up, when I explain what I’ve discovered, others are often struck into silence and begin to listen. Why? Because this philosophy has what they’ve never gotten from morality: a format that is directly applicable to life. Whether you’re Christian, agnostic or of any other faith, having a structured way of viewing the world will offer a fascinating boost to your ethical awareness. Learn to use morality as the constructive, life-shaping tool it was meant to be. Come to stand on the firmest moral ground, no longer concerned about being approved of or about what people think. Discover for certain your own moral worth (and as a result, enjoy twice the esteem without even changing anything). Gain a properly-integrated, all-encompassing world-view faster than ever before. Find your place in the world and live a life of the greatest impact and meaning. Take the driver’s seat when applying morality to everyday life. Most religions (and most philosophies for that matter) avoid the scrutiny of logic; not always due to their contents, but due to their own lack of comfort with the process of reason. An honest philosophy will not fear being questioned; it can withstand being torn down and rebuilt, time after time for its own validation and to address the evolving concerns of mankind. When the answers keep coming up the same, you know it’s right. The philosophy of Moral Armor walks through its own validation. It describes good and evil by exploring the lifestyle of the most moral type of man–or as I call him, Self-Made Man–from how he goes about his own life, to how he deals with others, to what kind of enterprises he involves himself in. It then turns the tables to expose the methods of his mortal enemy, Fear-Driven Man. It’s critical to follow his path of personal default, parasitical relationships and life-destroying institutions to help us steer clear of evil and protect us when we get snagged. Finally, Nature Itself Reveals a Moral Code the Whole World can Agree on. Most of us are committed to doing what’s right. We vow to uphold proper morals–wherever we’ve learned them–as a dedication to goodness; to being the best person we can be. We see no reason for there to be contradictions in our beliefs. Instead, we picture an ideal world as our most empowered, most fulfilled self, interacting with goodwill towards others for the greatest benefit of all. Many dream of when mankind will possess the knowledge to live in harmony with the flow of nature itself, where we’d tap into its grace and be one with the universe. That time has come. A select number within this group strives for moral clarity. We want to be certain that our actions have a positive effect on the world. We think for ourselves, and have the open-minded courage needed to find solutions that will bring us all closer together. We take action on what we learn, wishing to bring the living benefits of this flow to our families, our communities, and to all the nations of the globe. We are the truly patriotic; carefully considering our actions so they blend seamlessly from our beliefs to the ideals that built this country, and we don’t like seeing either betrayed. But in America, we leave people to their beliefs, which often differ from ours. These differing moral devotions keep us from being truly cohesive as a nation. We need to do what JFK said; find our most basic common link. We need to identify and expand our similarities if we want to bridge the gaps that keep us at odds. We as Mankind deserve a fully coherent code of ethics that rewards us for practicing the pattern of life. Few believe one could ever exist, but I’m here to tell you that there is a crystal-clear, non-contradictory structure for morality, and it’s based on nature itself. My intent was to turn any sense of helplessness I felt into an unswerving clarity of purpose. I wanted to gain an iron grip on Good and Evil, putting me in complete moral control over my life and ultimately permitting me to bathe in the cleanest, proudest spiritual freedom possible. I did it. I’ve named this philosophy after what it gave me and what we all need most: Moral Armor. What if Morality is Not Primarily Social? The most important trait to eliminate before an independent morality can be accepted, is our own fear. Most of us feel subservient in life: subservient to our mate, subservient to the system, subservient to our boss. We don’t want to rock the boat. Psychological weakness is so deeply engrained–so embedded in us–that most don’t realize its escapable, and easily. Imagine walking into Court or into a performance review with your Boss: your heart is pounding, your throat is dry you know you deserve a fair shake, but you’ve crumbled into fight or flight syndrome. What’s moral and just, goes out the window. When this happens, our bodies are telling us that we’re worthless and at their mercy. We submit. We tell ourselves that it’s our duty to sacrifice and just accept whatever’s brought down upon us. This is cultural morality speaking, and it’s time for it to shut up! Historically and presently, what those in power withhold in order to maintain power. The moral order of human values: what and who truly comes first? The moral basis of unshakable confidence. How to face anyone, anywhere, under any conditions, and get the respect you deserve. How to stand as an equal with all men–even those at the top. What if, just what if, morality doesn’t begin with our relations to others? What if its origin is experienced independently? What if this distinction has been withheld from us on purpose? I was on the verge of a major breakthrough. The fact is, morality was meant to protect us, and it’s a tool we cannot live without. If men have withheld the essence of our physical and spiritual freedom intentionally, it’s a threat to our very lives. Their reasons must be immensely powerful. Shouldn’t we be willing to risk it all to discover them? Discovered–Amazing Way to Decipher All Moral Actions. After ten years of research, I deciphered what many philosophers down through the centuries have called a mystery: I found that there is a pattern to cognition that we all share. I synthesized the pattern and then developed a moral/philosophical structure from it, which can be seen, tested and verified, in one sitting. What’s amazing is that our pattern of thought matches exactly, the pattern necessary to sustain biological life. I casually noticed this parallel, then was stunned when I realized I had discovered the very origin of moral action. If western philosophers weren’t so focused on empirical reasoning, they would’ve found it centuries ago! This leads us to an important distinction, and a sore point between religion and science. Reason itself didn’t mislead philosophers, it just turned out to be one step in a larger biological process (in other words, they couldn’t see the forest for the trees). With a faith-based morality or not, everyone wants to be reasonable (as the alternative is to be unreasonable), and the reasonable is the life-furthering. If you can acknowledge Life and Death as our world’s universally acceptable moral standard, then confirming ideas through nature makes morality easy to understand, easy to convey, and easy to use. The Wisdom of a Philosopher in Four Simple Steps. We all have our specialties. If you had to explain your job to me, I’m sure it would take forever. That’s been the problem in religion and philosophy from the beginning; the knowledge is just too complex. No one wants to get an engineering degree in order to start their car; they just want to turn the key! With that in mind, I’ve condensed my work into bite-size pieces so you can get this motor running with no fuss. The fundamental pattern that all living beings follow can be described in just four steps. Our moral worth is gauged by our adherence to these steps, as any other pattern will achieve life’s opposite. This clarification allows us to learn nature’s code of ethics very quickly for a basic understanding, or allows us to take our investigation as deep as we want. In no time, you’ll have an awareness that permits you to think like a philosopher. The True Nature of Evil Exposed! Many heroic figures are attacked, derided and laughed at, while they move mountains and change the course of history. When Jesus first began to speak for example, his own townspeople tried to push him off a cliff. Peace at Last Between Philosophy and Religion. This time it won’t be us against them regarding Western Philosophy and Religion, but the true War of the Worlds: Self-Made Man versus Fear-Driven Man. (But first, a history lesson). Back in the thirteenth century, St. Thomas Aquinas discovered the works of Aristotle. Aquinas wrote extensively on the subject, and was so persuasive that the Catholic Church absorbed the full works of Aristotle into the Christian faith. The work of Aristotle lies at the base of ALL major religions, serving as the rational, acceptable part. His work can even be found in Arabian teachings since the seventh century. Everyone is aware of Christianity as a moral code. The problem is, all moral groups look at the others with suspicion. Most of us have heard of Objectivism and Scientology, but would treat such people as “Oh, you’re one of those.” But how they chose their morality reflects how we’ve chosen ours: something in what they heard or read rang true, and made them want to know more. It convinced them enough to declare “This is right, and the right is what I stand for”, and to say it openly. Unfortunately, they have to gulp their way through what they don’t agree with (just like we do), and will, as long as what they like about it, outweighs what they don’t like. The world needs another Aquinas, as the fact is, if you cover up the name and look at the contents, most moral codes are surprisingly similar in practice. Looking forward, the common thread is that only a morality’s practical value can make it stick. So how should we view each other? As kooks? Or by acknowledging that out of all the people on Earth, morality is especially important to those who stand up to be counted, as it is to us. This is now easier to see, as by describing the natural patterns we all practice, Moral Armor has drawn a deeper moral parallel between all men than has ever existed. We can all stand together again; St. Thomas Aquinas would be glad to see his dream restored. With a healthy new bond between morality and reason, a much more satisfying peace can now reign. Do We have to Ditch Our Religions? There are no demands made here; just an acute observation of natural law. The beauty is that we all live by this philosophy already; I’m just revealing nature’s simple, yet profound, moral structure. 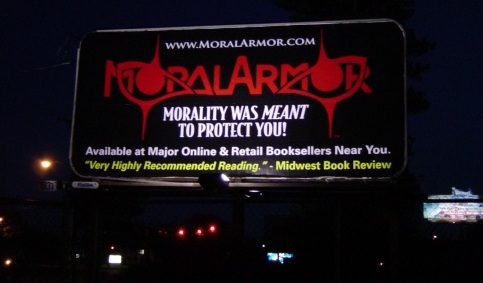 In another first, Moral Armor actually identifies where faith belongs within a rational mind. You’ll be left with a practically clairvoyant understanding of your own religion. I’m all for a lifestyle of physical and spiritual peace–that’s what I want to secure for us all, but we cannot disregard the fact that were in for challenging times ahead. I urge you to invest in yourself: take the first step necessary to acquire your Moral Armor, and I guarantee that you will be prepared for all the years to come. Could Morality Really Come from Nature Itself? Moral clarity is just a few steps away, but take a second to imagine what would happen if you don’t follow up. “This couldn’t be real” you might say. An organic morality? No one could’ve created such a thing; it’s just the claim of another cure-all. Then, you’ll walk away with no new answers. You’ll have no new freedoms. Your confusion about people and what’s happening in the world stays; right when you were offered a chance to escape it. But the fact is, the philosophy we accept forms the base of everything we do. If our philosophy undergoes a dramatic change, it will indeed affect every aspect of our lives. This is your opportunity to find out what life is like on the other side of moral confusion. Join us today, and you’ll soon be enjoying an immense new freedom; you’ll face every day with a lightness, relaxation and clarity you’ve never known. With a moral code we can prove, we can solve any problem–large or small, personal or social. What’s more, this new pinnacle can become your plateau. (Objectivism is a very powerful philosophy-based morality). Most people know that The Bible is considered the most influential book in the world. What most don’t know is that Atlas Shrugged by Ayn Rand is considered the second most influential book in the world. It’s interesting to note that the books chosen by our society as most important, are both about morality. That’s a good sign! Why Objectivism is a correct moral philosophy, but not a complete moral philosophy. How to quickly wipe out the isolation and contempt most Objectivists feel against outsiders. A Bridge of Aquinas for conveying western philosophical arguments constructively. How to regain the sense of youth and boundless freedom Rand intended you to have. A new razor for quickly validating (or invalidating) any premise, including those of Objectivism. How to share an objective morality in minutes; with your students, your friends and your children. Ayn Rand has advanced Western Philosophy so much that her followers can’t imagine a level beyond her exists. More than that, we think it will take years to explain and teach what took us years to acquire. With Moral Armor, you can do it in minutes now, and without hostility. A Quantum Leap for Scientologists. (Scientology is a popular psychology-based, self-help style morality). Discover the philosophically and naturally-sound, four-step structure of life. Learn how L. Ron Hubbard’s “Clear” operates throughout an overall moral code. Condense your knowledge of Scientology into a life and reason-based tool. Take your interest in moral investigations deeper than you ever imagined. L. Ron Hubbard has been criticized and called every name in the book, as has Rand. So has Jesus, Edison, Ford (most of those who’ve reached a pinnacle in life). Whether it’s Buddha, Gandhi or Moses, I won’t criticize. I’ll honor their contribution and expand on what I find useful; my intention is after all, the moral reintegration of our society. Let’s build bridges; not walls. Artistic Values are Crystal Clear at Last. Have you ever been at a loss for words, viewing artwork that seems to convey nothing but contempt for values? What’s claimed to be art has always been questionable to me. Art is confusing to a lot of people. It’s hard to describe the reactions we have to it, so Moral Armor dives deep to make things much clearer. Our artistic likes and dislikes turned out to be a telling factor in our moral development. They show how we feel about human beings and how we feel about our world. What we all prefer in art indicates the future advance or decline of our country, and how quickly we can change things. Be certain of any project’s moral impact–be it a movie, a video game or a CD, and its suitability for your children. Learn the hidden moral value of our greatest composers, painters, sculptors, film makers, and media professionals. As an artist, discover how much more you can convey with a fully-consistent moral code. See how timeless ideals can enhance your work’s longevity. As an observer, discover the exact moral countenance of those whose work you are observing, and never be speechless in this regard again. Fostering Wholesome Values in Our Kids. When I was young, there were very few adults around who encouraged me. I felt tremendous contempt for those who tried to fill my head with doubts–the limitations they accepted in life. I honored and respected the adults who inspired me to be the best I could be, and they’re the only ones I’m willing to associate with to this day. Since such adults were a rare and special exception, most of my time was spent alone, by choice. It wasn’t so difficult; being alone was magical. I felt as one with the world around me, and cherished the thrill of new discoveries awaiting me behind every corner. I still feel that way. Assure a child’s independence and self-esteem. Create a bond of endearment and respect that will last a lifetime. Help map out their futures. Pass down the most productive, invigorating traits. Assure your kids grow up morally-armed for anything life throws at them. Have them leave the nest soaring. The younger we start with a moral code that empowers us, the better off we’ll be. Look at all we’ve overcome in the Self-Help Generation. Imagine a generation born without fear or limitations. I can’t wait to see what they’ll do! Looking and Feeling Young, Forever! Something I noticed about this philosophy is how much better I felt on a daily basis. It wasn’t long before I started looking better, too. In contrast, I’m sure you’ve run into an old acquaintance and have been shocked at what the years have done to them. Stress destroys our looks faster than anything else. A moral code that relieves it will have a huge effect on what we look like in ten years. How moral clarity can take years off your looks and attitude. How to sequence events to bring you happiness automatically. How an inner smile can recover your status as a valuable resource to the young (conveying that life just gets better through time). How investing in yourself rejuvenates your self-image. How sincerity holds the key to the true fountain of youth. When our code of ethics is in a state of confusion, it adds significant stress to our medium of life. This fact is so buried we never notice the burden, yet it emerges in premature aging and in the distortion of facial muscles reflecting pain and loss, making us less attractive. A proper moral code frees us to focus on exhilarating activities and emotions, consistently exercising the facial muscles associated to beauty: high cheek bones, bright eyes and excellent posture; an energetic stance, ready for living. It’s a huge relief to know you’re aging slowly. I’ve just passed 40 with almost NO stress. How would you look with no stress? Is Your Relationship as Romantic as It Could Be? Our first relationship is with nature itself. When your life is positive and exciting alone, it will be clear that your mate should add to the positive flow, making it even better. This simple truth has made my relationships more fulfilling than I ever imagined they could be. With moral clarity improving your choices, romantic enchantment and true compatibility are right around the corner. How to see right through people. How to choose who finds you attractive. How to express how you truly feel, and not lose control in the relationship! The world’s most valid and easy-to-remember Compatibility Index. How to court with confidence. Where to find the best match. How to be sure you remain endlessly appealing to each other. Everyone should pursue romantic fulfillment, as that possibility is aroused in every passing smile. With moral self-awareness, you’ll draw higher quality people into your life automatically. When you’ve found the love of your life and can value the relationship openly, you’re much more likely to enjoy it for a lifetime. Can I Make Money and Pursue My Dreams without being Personally Attacked? You will be attacked for all of your life-furthering traits, which is why Moral Armor was developed in the first place. From birth, we’ve all stumbled into a moral war. All actions considered moral by Self-Made Men are declared immoral by Fear-Driven Men! Unhappy people will continue to attack you, but with the proper Armor, their arrows will just bounce off. You can act on your dreams with confidence, knowing for certain that you are morally right. Moral Armor provides shelter from the unjust accusations of selfishness and greed commonly associated to honest personal growth and achievement, as a proper code of ethics should. Such a code must flow harmoniously with the productive life of men who earn their livings, as all honest men must. Indeed, morality is the ultimate guide for human energy, ensuring that we spend it in the most efficient, effective and life-furthering way possible. I was born into a poor family, but acquiring a good work ethic has brought wealth into the lives of those around me; not loss, and has inspired others to follow. Trust someone who has broken through this nonsense. Many now have the moral certainty they never thought they would, and it’s time for you to join them. Never be Taken Advantage of Again. This is absolutely critical: the decent people of this world have always seen their ultimate goals frustrated by their inability to understand or express the moral foundation of their actions. The unfortunate result is that the tools of mass prosperity can be turned against mankind and used for mass murder. They can and they have, repeatedly, throughout history. The Bush administration was an infernal example of this, and such actions must be stopped. Our old premises not only bar us from what’s truly possible, they perpetuate a moral war between those who wish morality to make sense (so they can adhere to it openly), versus those who benefit from what blurs the lines. When you tap into the flow of life, you’ll be able to see where others are either not in the flow, or worse; oppose the flow. More than that, when you reach the point beyond all doubt that your moral course is correct–the point of total conviction by rational means–you become untouchable psychologically. The Choices People Make will No Longer be a Mystery. Moral Armor was borne of heartbreak, and the desperate need to understand the motives of others. Having discovered the key, the true patterns of good and evil have become so predictable, you’ll read people clearer than you ever have before. What’s nice about Moral Armor is that it’s easy to learn; just four steps to explain us all. You’ll not only streamline your relationships, you’ll become much more effective at helping those who’ve gone astray. Whether your challenge is confidence in action, avoiding bad relationships or just understanding your place in this world, the philosophy of Moral Armor will help you recognize, face and solve the moral dilemmas we all encounter, with strength, grace, and honor. A fully-integrated moral code based on the nature of Man. The true nature of evil: who they are, what they want, how they operate, and how to fight them. Elimination of the stress, guilt, hesitation, and fear associated to moral judgment. The only cognitive pattern leading to a morally-healthy mind. The four moral elements of every human action, and the four basic violations. A Compatibility Index for who to seek and who to avoid. How to achieve lifelong, bulletproof, naturally-regenerating happiness and self-esteem, and much, much more. Morality was Meant to Protect You! Through the development of Moral Armor, I acquired a spectacular moral power that I couldn’t imagine living without. It’s the exhilarating moral foundation that I desperately yearned for, yet was missing in my life. It made my purpose in life significant, and my direction clear. I now look forward to every day with bright eyes, and I’m confident it’ll have the same effect on you. By investing just a few hours, you’ll gain the secrets hidden in the fabric of nature that will protect you for life from the ethical pitfalls around us. Don’t miss the opportunity to experience a freedom beyond imagination. The order is tall I know; but word is, Moral Armor delivers! Why Not Keep It My Own Little Secret? I’ll admit it, I have a huge advantage over most people in life because of these discoveries. I’ve enjoyed the freedom it’s given me for many years; it has changed my life and enriched my relationships. But it doesn’t make me feel better to see others confused or hurting. I hate to see people suffer through no fault of their own. I want to share this knowledge, because witnessing all the positive energy and joy I can bring to others is the backdrop I need for a truly fulfilling life. I know the affect the world’s greatest philosophers have had on Mankind: Aristotle brought about the Age of Reason and America itself, while Marx destroyed half the world with Communism. As a philosopher, I know the power of what I’ve done. I see treacherous new laws being passed to cripple and destroy the country I love, and I want to change things. We can bring about a moral revolution and change the world, but it must happen one person at a time, and I can’t do it without you. On an individual level, nothing is more satisfying than turning the most hopeless outlook into complete moral empowerment. It’s a soul-saving endeavor of the highest esteem, but my ambition is much greater than that. Join me and we can restore our civilization; I guarantee it. Is There a Risk-Free Way to Acquire this New Philosophy? If you were to take a philosophy course at your local college, you’d be out over $600 and it would disrupt about sixteen weeks of your life. Worst of all, given the state of philosophy as it’s taught, you would emerge from it even more lost than before, or worse yet, intellectually paralyzed. Here, you’ll learn a hands-on, direct approach to morality which you can use right now, which rivals the best minds in the field with proven results. Or, you could hire a psychologist to help sort through your (or your children’s) issues at $200 per hour, week after week, month after month. The problem is, such professionals deal with the results of dysfunction, while Moral Armor wipes out the cause. Unfortunately, psyche professionals are not trained to deal with or recognize healthy people. It is my firm belief that most people are quite healthy in mind, and need guidance; NOT treatment. With the right tools, you can make great progress on your own; so I’ve brought the most powerful lessons of Moral Armor to audio. The fact is, most people who buy books, never get around to reading them. With CD sets, you can listen while you vacuum, do the dishes, wash the car, mow the lawn (Hey, I’m just as guilty. Since I finished my first CD program, I’ve barely picked up my own book!) To squeeze every last ounce of value from a bright new tool requires repetitive exposure and application, which makes CDs the perfect medium. My 4 CD set, A Bridge Between Us All, will give you a head start on the road to moral clarity. You’ll get an excellent overview of how this philosophy works, and you’ll get it fast. This set comes with a printed manual as many people like to read, underline and contemplate ideas at their own pace (I certainly do). With A Bridge Between Us All, you’ll see the bright future that’s possible for Mankind. It’s like seeing an artist or a warrior of spectacular skill, and wanting that power for yourself. At the point of deciding “I want this for my life”, you’re ready to begin your training: a complete and in-depth study that will take years off your learning curve. With Moral Armor’s flagship 12 CD program, Sovereignty, I take you by the hand and lead you there. Each major facet of the philosophy gets its own CD and a few get two, so you can really focus in for a thorough and truly usable understanding. While A Bridge Between Us All will excite your hope and awaken you to a new dawn, Sovereignty will change your life. You’d have to be nuts, but if after 30 days you decide this kind of moral clarity is not for you, return it for a full refund. I won’t ask why. Feel free NOT to decide right now whether my contribution is valuable. You can give the CDs a whirl with no risk and see for yourself! The fact is, my readers and listeners often become my friends. We’re partners in a better future for us all, and I want nothing but goodwill between us. No matter how many people I reach, through radio, television or print, it’s only so many. The harsh reality is that only a select few believe in themselves enough to invest in their own futures. They think life can be better if they’re better prepared to deal with life’s adversities as well as its blessings. It is they who move the world in a sound, civil, moral direction, and they’re the type of people I want and need to hear from! Expanding on this goodwill, here are a few things I hate about programs I’ve bought in the past: 1. The 18 tape program that turns out to have 20 minutes of information on either side of a ninety minute tape. Who out there just loooves to rewind for ten minutes? 2. CDs that have ONE 60 minute track, so you have to listen to the whole thing again if you get interrupted. Who’s been 7 minutes to the end and had to shut it off? Arrrrrr!!!! 3. Programs with the same lame music over and over that just grates on your nerves after the third tape or so. The 70’s are over. All of Moral Armor’s CDs have tracks every four minutes, making it easy to find your place again, and I’ve packed as much valuable information on every disc as possible. Most are in the 72 minute range. Because of the length, you get an intermission every fifteen minutes to come up for air before diving back in, and every CD has its own music to match the mood of the subject. When Push Comes to Shove, We have to be Right. We’re in for tough times in the near future, and it won’t end with the economy. Some of our politicians seem hell-bent on war with the entire Middle East, with no Kennedy-like concerns for the lives of our military men and women, and even less for their enemy. I don’t want war with the Muslim nations; they’re as much a prospect for this boost in moral clarity as any other. But if hostilities are inevitable, we must strengthen our resolve; not only for the trials to come, but for shaping the kind of world we’ll inherit afterwards. America and all free nations must show one united front to the world, and I submit that the moral code we can all agree on can only come from nature itself. We’ve got to mature; none of us can win, pushing what we can’t prove. We can’t permit the world we leave to our sons and daughters to be anything less than what we know is best for everyone, so let’s show the world what we can do. I hope I’ve conveyed this information with the depth of sincerity I truly feel. Ive devoted my life to this because I believe in you, as much as I believe in myself. Join me, and together we can change the world. Quick Start Plan: To get started right away, please drop everything else you’re doing, order through the site (it’s safe) or complete the order form available on the products page and fax or mail it in. I’ll get your package out right away, and soon you’ll begin to see our world in a fascinating new light. With a format for living that brings peace and fulfillment to all those awakened to it, harmony will spread. Our generation and the one to follow will become empowered like never before. Instead of our citizens hoping for the perfect leader to emerge and protect us from evil, we’ll see a leader developing in every life. Then, you’ll know that the social and political reforms we’ve been wishing for are only a matter of time.